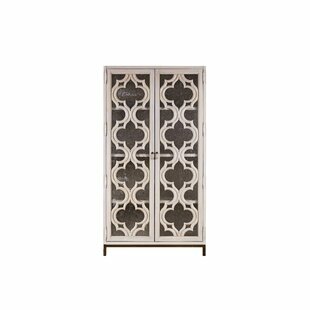 Made from grey-finished wood, the Accent Cabinet is a beautifully designed four-door cabinet with stunning geometrical patterns on the doors and a curved front. 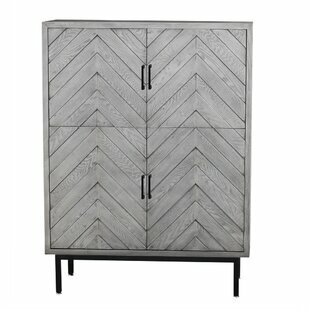 Each door is also equipped with a metal door handle finished in a graphite tone for added convenience. 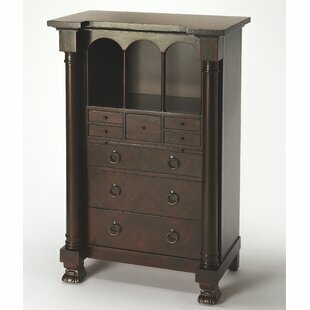 The fixed shelves offer ample storage space for all your favorite items. 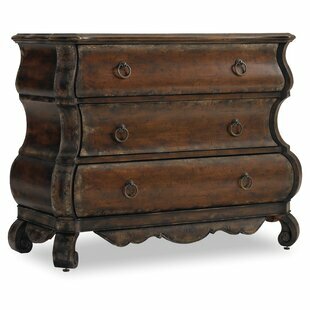 Base Material: Solid Wood Top Material: Solid Wood Tipover Restraint Device Included: No Overall: 33 H x 47.25 W x 15 D Overall Product Weight: 82.67 lb. 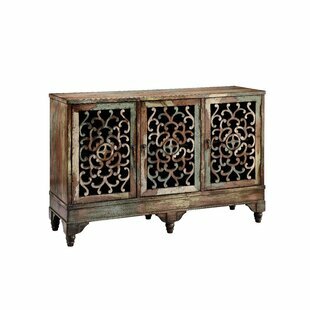 A outstandingly attractive oriental style cabinet, with a practical and beautiful combination of drawer, shelf and cabinet space. 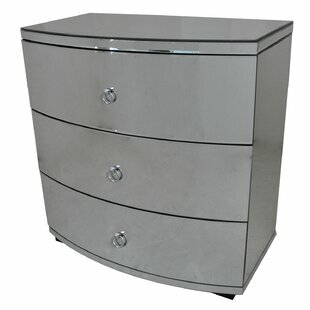 A classic in traditional Japanese and Chinese furniture traditions. 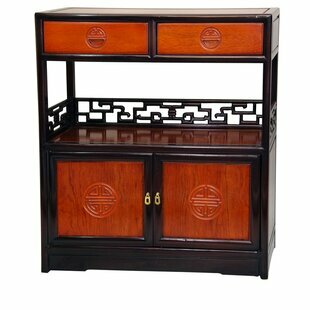 These are handmade cabinets, built from solid kiln dried Rosewood, with Shou medallions symbolizing longevity and wonderful, authentic geometric carved key design rails for good luck. 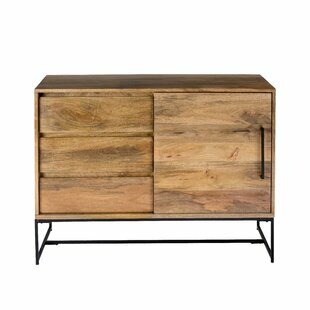 Base Material: Solid Wood Number of Drawers: 2 Tipover Restraint Device Included: No Overall: 34 H x 30 W x 10 D Overall Product Weight: 39 lb. 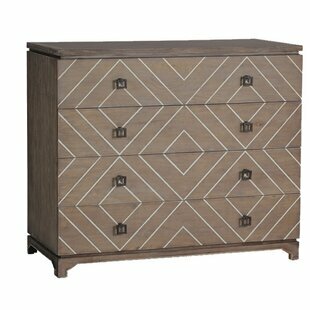 Come closer to the Melange Breck 2 Door Accent Cabinet, and you will discover something unexpected, an eclectic blending of colors, textures and materials in a vibrant accent cabinet of one-of-a-kind artistic pieces. 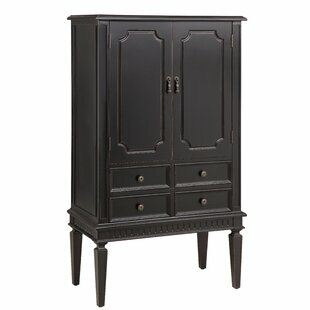 It has soft close hinges with one adjustable shelf behind the doors and has a ventilated back panel. Base Material: Solid + Manufactured Wood Top Material: Solid + Manufactured Wood Tipover Restraint Device Included: No Overall: 33 H x 42 W x 19 D Overall Product Weight: 151.8 lb. 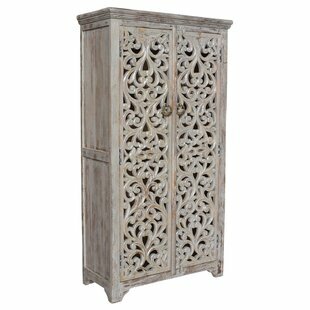 Ideal in a home with light decor and plenty of sunlight, this 4 Door Accent Cabinet features exquisite molding and distressed accents. 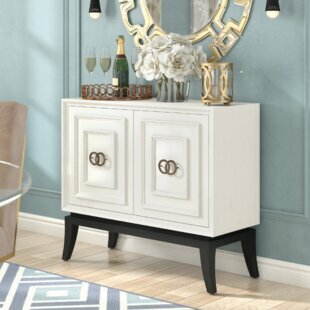 Constructed from MDF and pine, this accent piece is finished in an antique white finish with contrasting antique black hardware on the doors, which beautifully conceal adjustable shelves inside. Base Material: Solid + Manufactured Wood Top Material: Solid + Manufactured Wood Tipover Restraint Device Included: Yes Overall: 33.2 H x 47.5 W x 15 D Overall Product Weight: 61 lb. 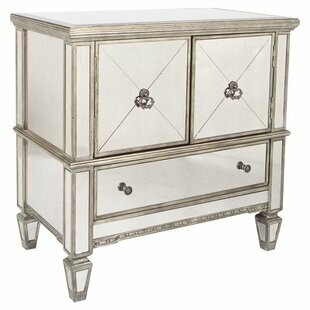 Looking for the perfect piece of jewelry for your room? 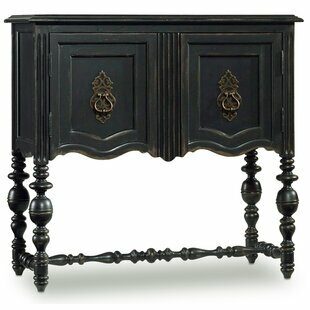 Place front and center of your hallway, living room or foyer and top with things you love. Now thats instant style. Base Material: Solid + Manufactured Wood Top Material: Solid + Manufactured Wood Tipover Restraint Device Included: Yes Overall: 34.25 H x 36 W x 17.5 D Overall Product Weight: 112.2 lb. 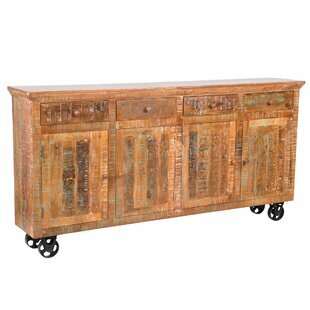 This console has been beautifully handing carved by skilled artisans that have taken years to learn their craft. This kind of work is not often found in the states and will become a treasure that is passed down from generation to generations. 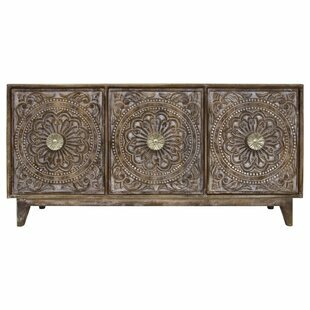 Made from mango wood each panel has been lovingly carved to give you a beautiful lasting look. 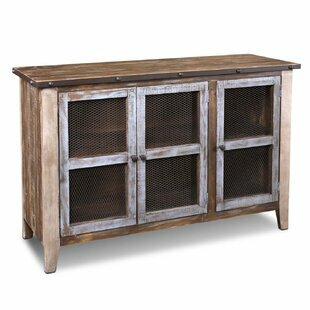 Single inner shelf with cord management makes this a piece that can be used in a wide variety of rooms within your home. 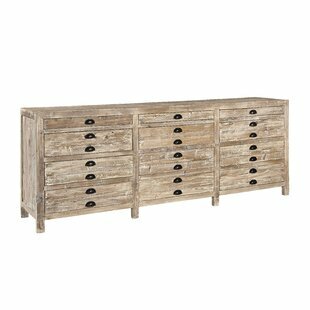 Each door has a large carved wood handle... Base Material: Solid Wood Top Material: Solid Wood Tipover Restraint Device Included: Yes Overall: 35 H x 69 W x 16 D Overall Product Weight: 152.9 lb. 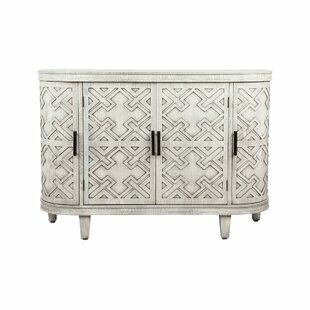 Add a touch of sophisticated style to your abode with this eye-catching accent cabinet. 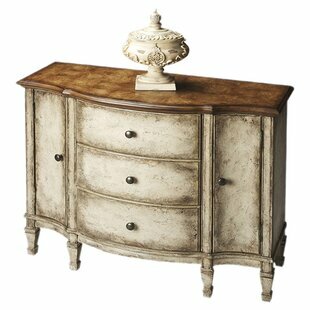 Crafted in India from solid mango wood with a distressed light cream finish, this piece is perfect for adding a worldly touch to your ensemble, and is fitting in a variety of traditional aesthetics from farmhouse to country cottage. It strikes a rectangular silhouette. Base Material: Solid Wood Top Material: Solid Wood Tipover Restraint Device Included: Yes Overall: 76 H x 39.5 W x 18 D Overall Product Weight: 94 lb. Base Material: Solid + Manufactured Wood Top Material: Solid + Manufactured Wood Tipover Restraint Device Included: No Overall: 29 H x 31.9 W x 16 D Overall Product Weight: 85.1 lb. 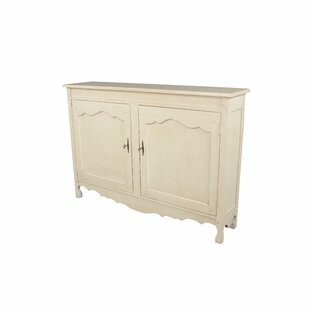 Lend your space a touch of sophisticated French-country appeal with this four-door accent cabinet. 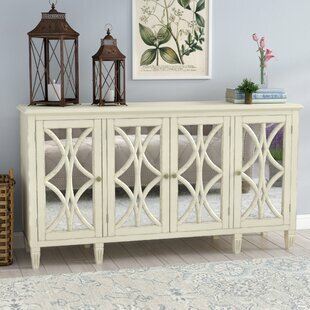 Crafted of solid and manufactured wood in a tastefully distressed cream finish, this charming design strikes a rectangular silhouette with elegant moldings, stately paneling, and fluted spade feet. 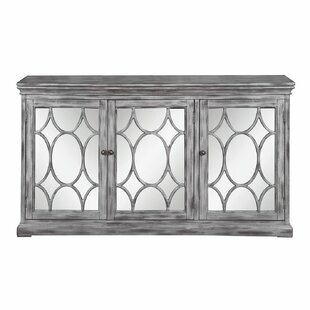 Four doors with mirrored inserts and intricate wooden overlays open to a posh red interior with shelved storage for dinnerware, serving dishes, barware, and more. 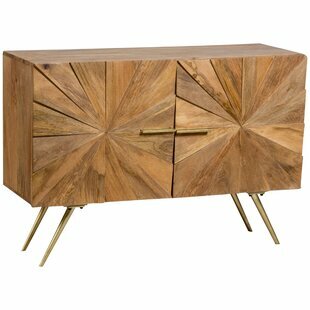 Rounding out the design, the expansive... Base Material: Solid + Manufactured Wood Top Material: Solid + Manufactured Wood Tipover Restraint Device Included: Yes Overall: 34 H x 64 W x 18 D Overall Product Weight: 123 lb. Base Material: Solid Wood Top Material: Solid Wood Tipover Restraint Device Included: Yes Overall: 41 H x 40 W x 18 D Overall Product Weight: 143 lb. 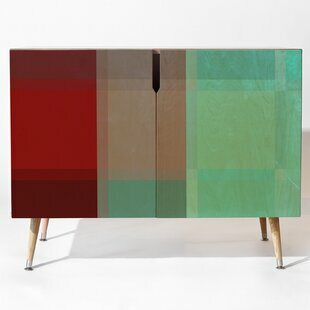 This cabinet features inlaid slices of natural mango wood. 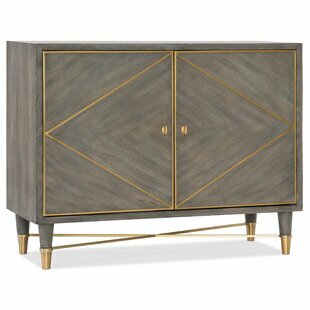 Handcrafted by artisans in India, this modern cabinet has elegant architectural gold hardware and flared legs. 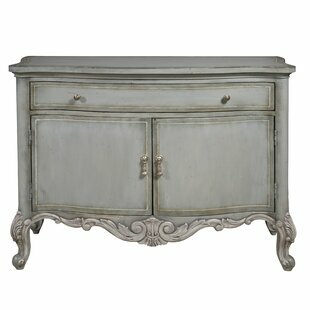 The perfect accent piece for today eclectic home. 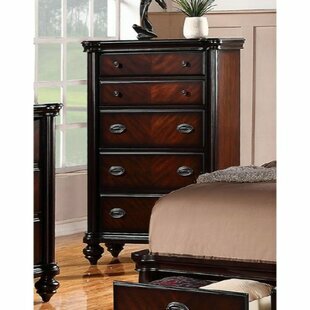 Base Material: Solid Wood Top Material: Solid Wood Tipover Restraint Device Included: No Overall: 33 H x 48 W x 19 D Overall Product Weight: 98 lb. 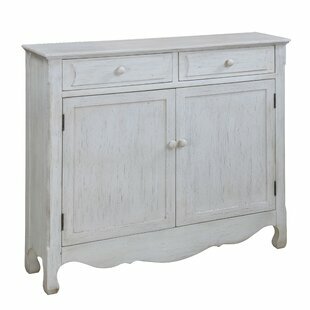 Perfect for extra storage or as an entertainment console, and is constructed from birch veneers. Base Material: Solid + Manufactured Wood Top Material: Solid + Manufactured Wood Tipover Restraint Device Included: No Overall: 32 H x 47.25 W x 14.25 D Overall Product Weight: 127.6 lb. 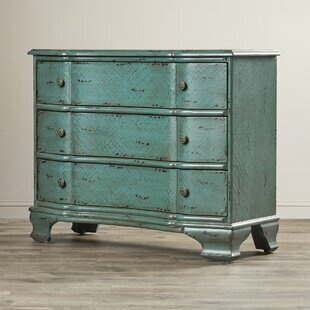 Base Material: Solid Wood Number of Drawers: 3 Tipover Restraint Device Included: No Overall: 34.5 H x 47.25 W x 19.25 D Overall Product Weight: 136.69 lb. 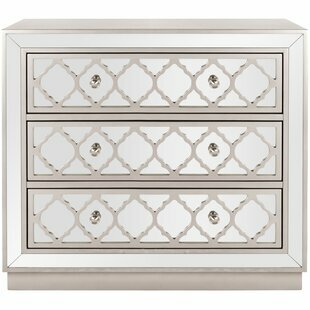 From filling empty corners with personality to keeping essentials stowed in reach and out of sight, accent chests offer a range of options to any interior space. Like this piece, for instance. 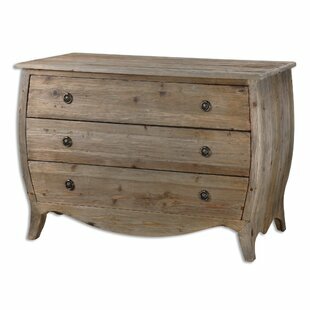 Steeped in French country influence, this chest features a clean-lined elm wood construction in a Belgian wheat finish. 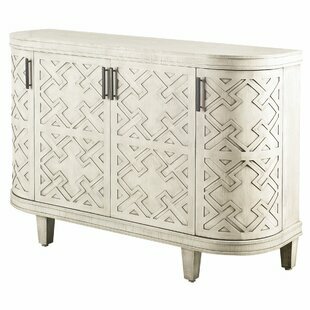 Its pair of doors steal the show; each sporting glacial glass, pendant pulls, and barbed quatrefoil overlay. 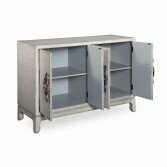 Behind the doors, youll find three shelves one fixed, two adjustable... Base Material: Metal Top Material: Solid + Manufactured Wood Tipover Restraint Device Included: No Overall: 82 H x 44 W x 19 D Overall Product Weight: 242 lb. 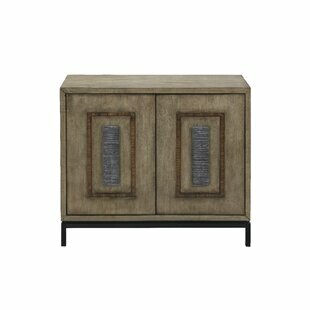 This Great Dunmow Accent Cabinet features a textured off-white frame and nanum doors that open to a lovely spacious cabinet. Base Material: Wood Top Material: Wood Tipover Restraint Device Included: Yes Overall: 36 H x 50 W x 18 D Overall Product Weight: 154 lb. 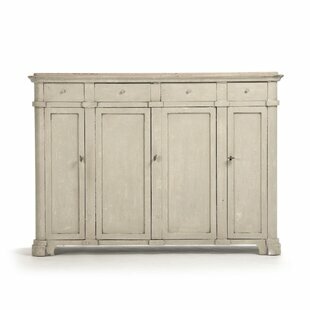 This natural wood tone of this 4 Door Accent Cabinet will make any room feel just a bit cozier without sacrificing on style. 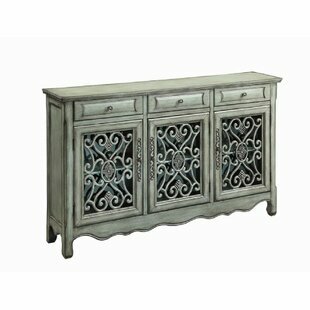 The wooden four door accent cabinet has a soft design that will blend with all decor. 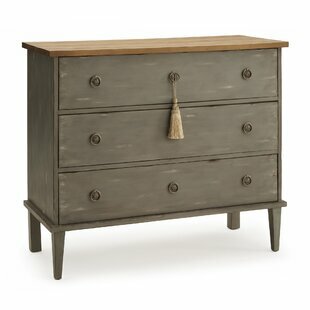 Perfect for when you really need that extra storage in a small space. Base Material: Manufactured Wood Top Material: Manufactured Wood Tipover Restraint Device Included: No Overall: 52 H x 39 W x 15.7 D Overall Product Weight: 100 lb. 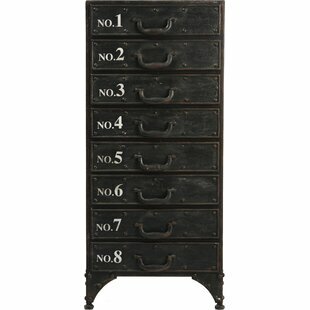 Base Material: Wood Number of Drawers: 2 Tipover Restraint Device Included: Yes Overall: 37 H x 41 W x 11 D Overall Product Weight: 70.4 lb. 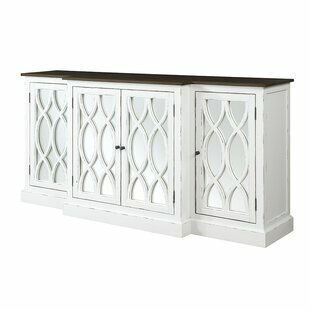 This Kinsley Curio 3 Doors Accent Cabinet is made from South American pine. 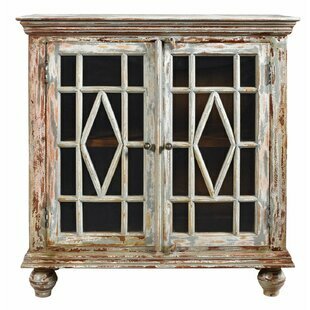 Its 3 doors have wire mesh inserts and a metal nail head accent trim around the top to complete the rustic look. Base Material: Solid Wood Top Material: Solid Wood Tipover Restraint Device Included: No Overall: 36.75 H x 55.5 W x 18 D Overall Product Weight: 77 lb.